From the website of the Dutch MFA I found the text of the Dutch national anthem in English. I think that a lot of the Dutch would understand (some parts of) this English translation better than the mysterious, ancient words from 1570, that we sing so fervently without completely knowing its meaning (the Dutch language has changed more over the centuries than most other languages). Nonetheless, in some Dutch schools pupils have to learn this complete ancient text by heart (although usually, in most schools, this is restricted to only the first and the sixth verses). It's something like learning Shakespeare in the United Kingdom, I guess. The Dutch national anthem, the Wilhelmus, has fifteen eight-line verses. It was written between 1569 and 1578. Based on older songs, the Wilhelmus takes the form of an acrostic on the name of William of Orange, the leader of the Dutch revolt against Philip II of Spain. The lines were probably composed by a Dutch exile in Germany and polished by the poet and diplomat Philip van Marnix, Seigneur of Sint Aldegonde. The first and sixth verses are usually sung on national occasions. In the first verse, Prince William vows that he will remain true to his country unto death; in the sixth, he prays to God for strength to rid the land of tyranny. In periods of oppression especially, these verses have had a powerful appeal for the people of the Netherlands. On 10 May 1932, it was decreed that on all official occasions requiring the performance of the national anthem, the Wilhelmus was to be played. Before that time, the Wilhelmus had been sung on many official occasions and at many important events since 1568: events such as the siege of Haarlem in 1573 and the ceremonial entry of the Prince of Orange into Brussels on 18 September 1578. Trumpets sounded the Wilhelmus when Prince Maurice visited Breda, and again when he was received in state in Amsterdam in May 1618. When William V arrived in Schoonhoven in 1787, after the authority of the stadholders had been restored, the church bells played the Wilhelmus continuously. By then, it had come to be called the "Princes' March", having been banned during the rule of the Patriot party. At the celebrations marking the birth of the child who would later be King William II on 16 December 1792, it was sung after High Mass in the Catholic church in Venlo. Following the surrender of 's-Hertogenbosch to the French on 9 October 1794, the garrison withdrew with full military honours to the sound of the Wilhelmus. However, at the foundation of the Kingdom of the Netherlands in 1813, the Wilhelmus had fallen out of favour. After a contest for a national anthem was held in 1815, a poem by Hendrik Tollens - "Wien Neerlands Bloed" (Whose Dutch Blood) - became popular. The music was by the composer J W Wilms. "Wien Neerlands Bloed" was gradually replaced by the Wilhelmus during the nineteenth century; the latter gained ground particularly after the southern Netherlands seceded in 1830. Indeed, the Wilhelmus was played and sung when new Acts of Parliament were promulgated. It was also played at the unveiling of the Plein 1813 independence memorial in The Hague in 1869, and again at the inauguration of Queen Wilhelmina in 1898. However, the Royal Netherlands Navy and the National Police Force continued to require a salute to honour both anthems until 1939. In 1567, Prince William of Orange fled the Netherlands with thousands of other opponents of Spanish rule. The following year, he tried in vain to free his country from tyranny and religious persecution. But his three invasions with mercenaries from the Holy Roman Empire failed completely. The poem is both encouragement for the Prince and a manifesto aimed at gaining support from the German princes for his cause, by portraying Orange as a prince fighting for freedom of religion on an equal footing, rather than a rebellious subject of his lawful sovereign, Philip II. The writer depicts the Prince addressing the oppressed people of the Netherlands in this terrible and dramatic situation. In his elevated speech, interrupted by a prayer in verses six and seven, the Prince bears witness to his sincerity and determination, and expounds his innermost motives for rising against the King of Spain. William comforts his followers, but at the same time exhorts them to join in the struggle. He also reminds them of their duty to obey God. In what might be called a psalm of defiance, the poet compares the Prince with David, who had to flee from Saul, the first King of Israel, before himself ascending the throne. He commends the Prince to the people as the chosen leader of the revolt against the King of Spain. The tune of the Wilhelmus is based on a French soldiers' song, which was popular around 1569, and alternates between three/four and four/four time. It probably originated at the time of the siege of Chartres. 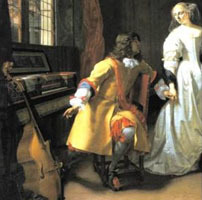 The melody was further developed by Adriaen Valerius (approx. 1575-1625). The oldest copy of the Wilhelmus is to be found in Deuchdelijk Solutien (Antwerp, 1574). Since 1626, it has been included in Valerius's Gedenckclanck, a well-known collection of national songs. The official version is the arrangement by Walther Boer, dating from 1932. The song's style resembles that of the work of the Rederijkers ("rhetoricians"), sixteenth century companies of poets. For example, the first letters of the fifteen verses spell the name "Willem van Nassov". The text is also thematically symmetrical, in that verses one and fifteen resemble one another in meaning, as do verses two and fourteen, three and thirteen, etc, until they converge in the eighth verse, the heart of the song: "Oh David, thou soughtest shelter/From King Saul's tyranny". The sober language and deep feelings that inspired the Wilhelmus make it far superior to the fashionable works of its period. 5 Full text of the Dutch National Anthem, the "Wilhelmus"
 In the original Dutch version Prince William states that he is of Duitse bloed. In this version that has been translated as being of Dutch blood. However, Duitse comes from Deutsch (German) which is different from being a Netherlander (especially to Netherlanders themselves). Instead, Duitse bloed refers to William's German background as Count of Nassau, an ancient principality in Germany.